I feel good this morning. I haven’t felt so hot for the past few days, so I noticed. I’m not sure if my ambiguous symptoms have been caused by allergies or a bug, but! I’m on the mend. No more afternoon naps for me. My mama would tell you that I quit taking naps at the age of two (my poor mom), so sleeping during the day is truly an unusual phenomenon for me. I’ve also been avoiding the kitchen as much as possible and, when my stomach starts to growl, throwing together one-serving meals that don’t leave a family-sized mess to clean up. It’s been a good reminder that simple, quick and wholesome recipes are always much needed and appreciated. 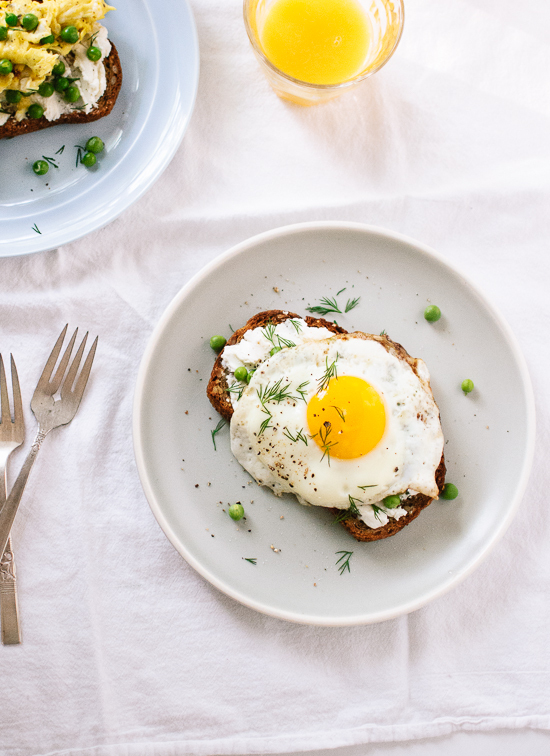 This eggs-on-toast recipe is just that. It’s super simple and ready in ten minutes. 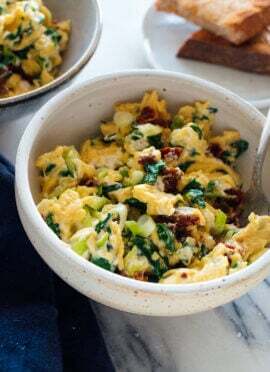 You can prepare your eggs however you’d like—scrambled, fried, even poached. 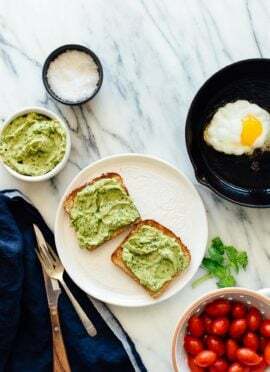 Toast your bread and slather on a healthy amount of goat cheese (or smashed avocado, ricotta, hummus). Prepare some vegetables to provide a fresh component (I used peas for a spring version, but can’t wait to try sliced heirloom tomatoes this summer). Top with egg, salt and pepper, and a sprinkling of fresh herbs. I opted for dill because I really love dill, but any leafy herb will do, like basil, parsley, mint, cilantro or chives. And you’re done! I’m going to keep this post short, but here’s some recommended reading that has gotten my wheels spinning lately: Zosia Mamet on Why She Won’t Lean In, Thanks and Kate Arends on Staying Sane on the Internet. I’ve also been meaning to tell you about my real-life friend Jennipher‘s new book, called The Anti-Diet: 10-Minute Fixes to Get the Body You Want and a Life You’ll Love. I went to her book signing and wanted to give her a high five every time she read from the book—it’s all about loving yourself and taking good care of yourself, with practical tips on how to get there. I wish someone had handed me this book in college. 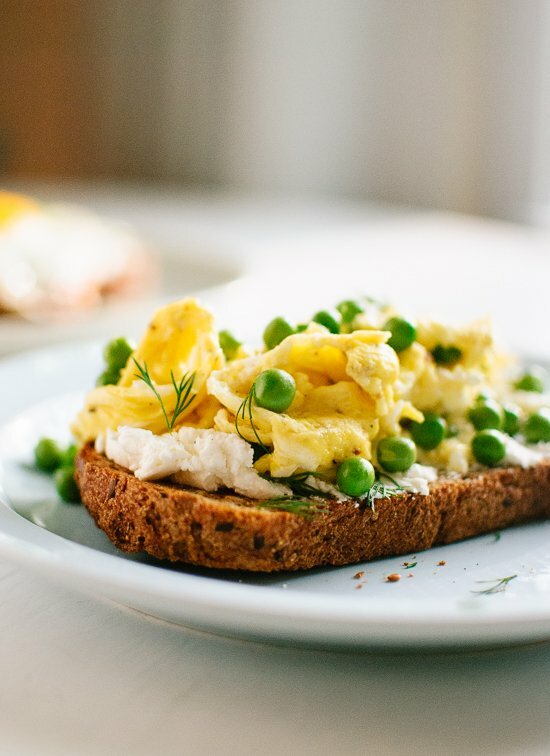 Goat cheese slathered on whole grain toast, topped with an egg (fried or scrambled) and a sprinkling of fresh peas and herbs. An easy breakfast or any-time-of-day meal. Bring a small pot of water to boil for the peas. Toast your bread. Spread a generous amount of goat cheese on top (if your goat cheese isn’t spreading easily, transfer it to a heat-safe bowl and microwave for 10 seconds). Once the water is boiling, drop in the peas and cook until crisp-tender, about 90 seconds. Drain the peas and return them to the pot. If you’re planning to fry your egg, sprinkle your cooked peas onto the goat cheese and gently press down on the peas so they stick. Prepare your egg(s) as desired. 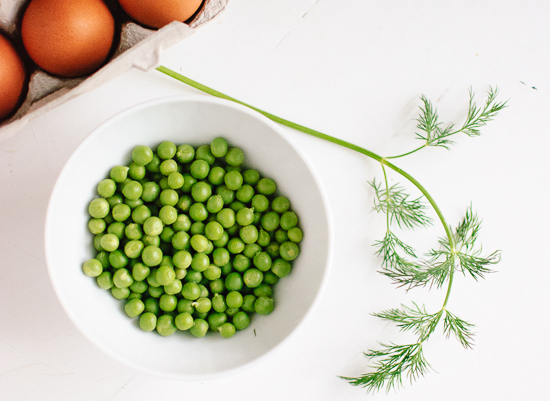 If you’re scrambling the eggs, season the eggs with salt and pepper before cooking, and toss in a handful of peas before the eggs set. Transfer the cooked egg(s) on top of your goat cheese-covered toast. Top with a slight sprinkle of chopped fresh herbs, salt and pepper. Recipe inspired by What Should I Eat for Breakfast Today. Make it dairy free: Sub avocado, smashed with a sprinkle of salt, for the goat cheese. 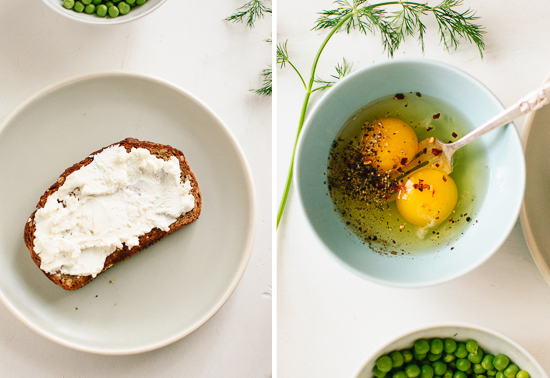 Change it up: Peas are just a spring variation on this goat cheese and egg toast! In the summer, I’m going to top my toast with sliced heirloom tomatoes and a sprinkle of chopped basil. In the fall and winter, I’ll try it with roasted winter squash and fried sage. So simple and delicious! I unlike most of my friends and family LOVE goat cheese, I really should buy a piece for myself and just have it with toast and tomatos! Glad to hear it, Sharlynn! I didn’t love goat cheese until a few years ago, but now I can’t get enough of the stuff! I just wish that I had learned to like goat cheese during my semester in France. I missed out on a lot of delicious goat cheesy things while I was there. I have versions of this for dinner sometimes. So filling and so healthy! I have never used goat cheese on my version, so I will have to try it! So simple and elegant! I love it. Eating peas in the springtime is the best, they never taste so good like they do now. These look so fresh and delicious! I am usually home alone at lunch time, and I am always looking for simple meal like this. Thanks! The photos + recipe look delicious (as always)! And I really, really enjoyed the two articles you mentioned. Thank you for sharing. there’s really nothing better than egg toasts – filling, easy, and a quick cleanup! loving the flavors you paired together here, and totally love these vibrant, spring-y photos! glad to hear you’re on the mend, kate! Thanks, Lindsey! Hope you’re well. This is too funny… I literally just ate this for lunch and then saw your post. Great minds think alike! Goat cheese + egg = heaven!!! Great and simple looking recipe suggestions. I like to use goat cheese on bagels instead of cream cheese at times. Good idea, Matt! Just had a head-smack moment and wondered why I haven’t done that yet. The photos look great too. Lighting and colors make it look so tasty. Glad to hear you’re feeling better, Kate. It seems like we’re the same; no daytime naps here either. If I take a nap, I’m a total mess for the rest of the day. I love this toast in all its simplicity. So fresh and sunny. My kind of meal! Carbs & cheese, with some vegetables thrown in for good measure. Mm, carbs and cheese. I’ve been stuffing myself full of queso and chips at Mexican restaurants lately. So good! Hope you have a great holiday weekend, Cara. There’s something so spectacular about fresh peas in Spring. I love this recipe! It’s a revelation, right? I just wish I loved goat cheese when I lived in France for a few months in college. They put goat cheese on everything! I love how simple this is – gorgeous seasonal and fresh flavours. Just my kind of food. And such stunning photos too! I loved Zosia’s piece – thank you so much for sharing. I can completely relate. I went to law school and practiced for a few years and sometimes I feel like I’m “selling myself short” by trying to get this little blog of mine up and running. I don’t think people intend to come off as judgmental when they ask me what I’m up to, but sometimes it feels like a lot of people don’t understand why I’m not trying to be a partner at a big law firm. Anyways, your blog is a continual inspiration and I love your posts!! Lovely simple idea, especially for a recovering invalid! I have some ricotta cheese in the fridge that needs to be eaten up, so I may well make this tomorrow morning with fresh basil and … ? Well, I’ll keep thinking about what veggie to add – sure I’ll come up with something! Hope you loved your breakfast, if you got a chance to try it! Yes, yes! Simple sandwiches like these totally make my day. 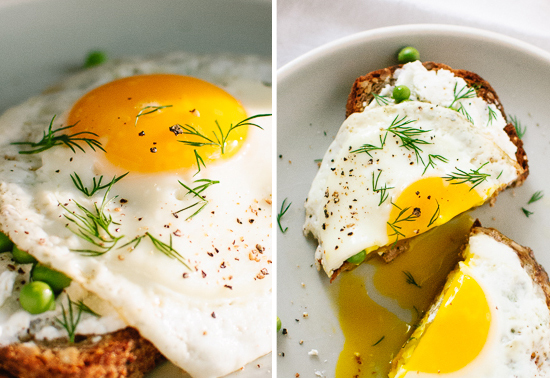 I love the idea of combining fresh spring peas with that beautiful runny egg yolk–so good. This is just wonderful! I’ve been eating plain sunny-side up eggs every morning this week…. they could use a little sprucing up! Goat cheese and spring-y notes, yes please! This looks amazing! Thanks for sharing, I hope you feel better! My sister and I did tomatoes on toast with an egg all last summer! But we used ricotta cheese instead of goat cheese, and added some spinach. So yummy! Oh, your version sounds delicious! 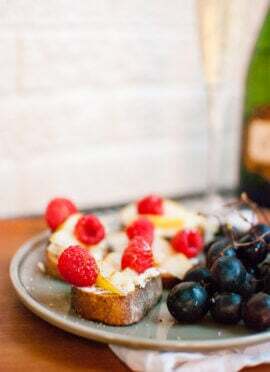 I love simple toasts like this! Sometimes they are just what the doctor ordered :) I don’t eat a ton of dairy these days, but goat cheese is something I don’t think I can ever give up, it is so heavenly tasting! I also love the addition of the dill, so fresh! Thanks for sharing the Zosia Mamet article. So true, we define ‘success’ way too narrowly. always love your recipes, Kate!! Well I’m glad to hear you’re feeling better!! I need so many more easy meals like this in my life. I’ve been so bad about making dinner lately, and if it was this easy/required this little mess I would cook every night! Three cheers for simple recipes that are easy to make for one. I plan on making this soon, along with your veggie English muffin sandwich. :) Thanks, Kate and happy Memorial Day weekend! Paige, thank you! I hope you had a wonderful weekend and that you’re enjoying those simple egg meals. Looks incredibly appetizing for something so simple. I think I’ll opt for fresh baby spinach leaves instead of peas although looking at your pic, I have pea envy. They’re so plump and round! That almost sounds dirty, I know but my peas never look that good! This simple supper sounds perfect for this time of year. Hope you are feeling better. This is my ideal breakfast the pictures look so lovely and fresh. I would make this with ricotta, dill, peas and fried eggs! I just made this recipe for my super cute little sister’s breakfast. HA! But she hates peas so I prepared it without peas. I just ate one and still delicious. Thanks! Ha, that’s funny. I’d eat these, peas or no peas, definitely!